Tracer, Live, Boxes or Packages, check your state LAWS! COLLECTIBLE AMMO, Current & Obsolete, All Countries. CLOSE OUT SPECIAL: Reg. retail $69.99 buy 2 boxes @ $49.99 per Box and save $40.00! 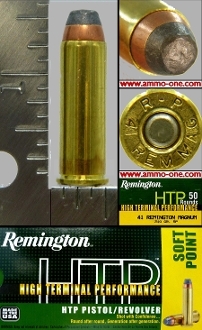 One box of 50 Cartridges: 41 Remington Magnum by Remington, factory loaded using “New” Remington Brass cases and a 210 grain JSP (Jacketed Soft point) projectile. History of the 41 Remington Magnum Cartridge: The 41 Remington Magnum was introduced in 1964 for the Smith & Wesson Model 57 revolver. The projectile or bore is .410" vs. the .401" 41 Long Colt. This is a great caliber that is primarily used in revolvers only and fills the gap, between the 357 (S&W) Magnum and 44 Remington Magnum.